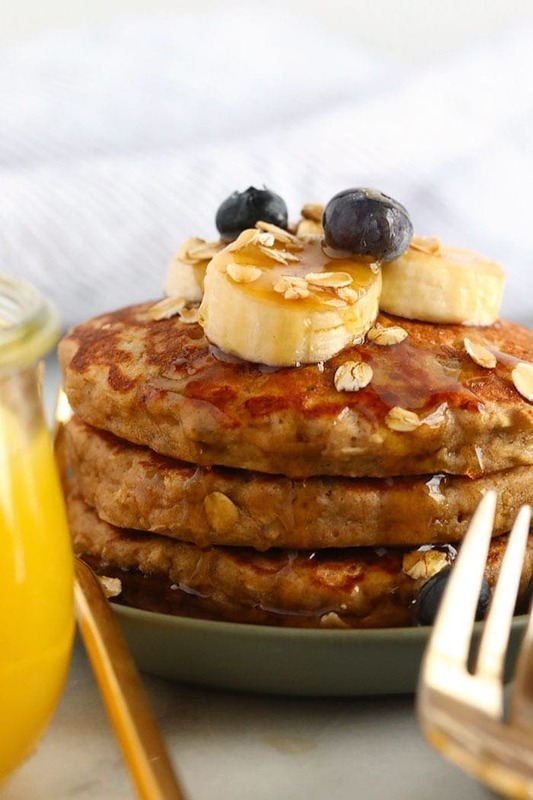 Start your morning off right with these fluffy banana oatmeal pancakes! We’re excited that these gluten free pancakes that don’t taste…like “gluten free pancakes.” They’re made with a combination of oat flour and rolled oats, plus eggs, coconut oil, and of course, mashed banana! You bet your bippy my Sunday fun day starts off with pancakes. I would say 9 times out of 10 Mark and I make some kind of healthy pancakes on the weekend. Why? Because it is the food of the Gods! We also love having a quick and easy breakfast ready on Monday mornings. Anyone else wake up on Mondays sort of disheveled? 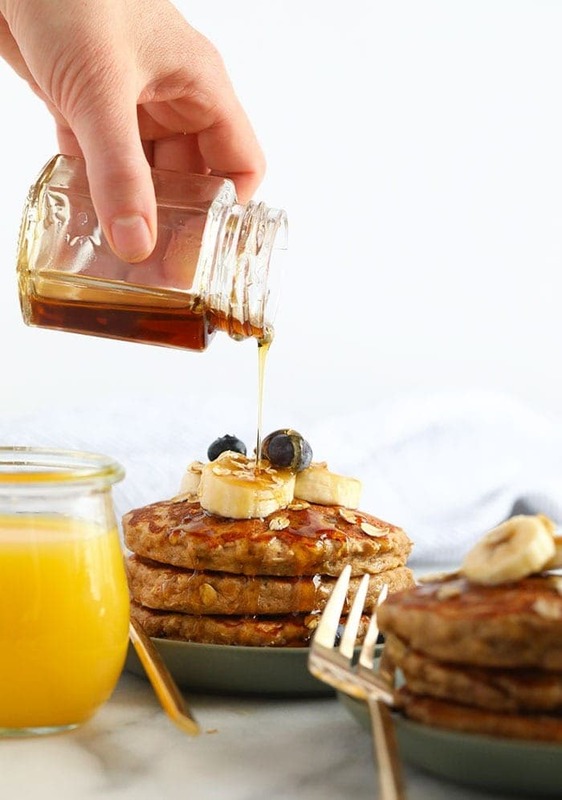 Today we’re sharing a highly requested breakfast recipe — Banana Oatmeal Pancakes! 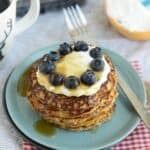 Most of our healthy pancake recipes on Fit Foodie are made with white whole wheat flour, but today we’re keeping this recipe 100% gluten free. 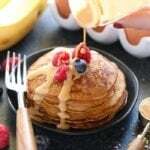 For these Banana Oatmeal Pancakes, we not only used rolled oatmeal but also ground oat flour for the base. 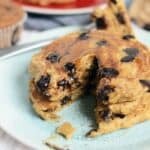 This amazing gluten-free pancake recipe is made with a ground oat flour base and doesn’t use any other sweeteners than mashed bananas. Add in some vanilla extract and coconut oil and you’ve got yourself the best gluten free banana pancakes out there! 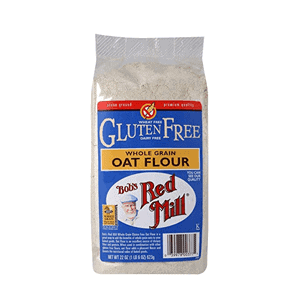 ground oat flour: no oat flour at home? No fear! Grind up some rolled oats into a fine flour and you’re good to go! If you are celiac, make sure you buy the certified gluten-free version at the store. We suggest Bob’s Red Mill. 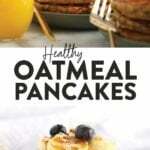 rolled oats: They wouldn’t be oatmeal pancakes without the oatmeal! 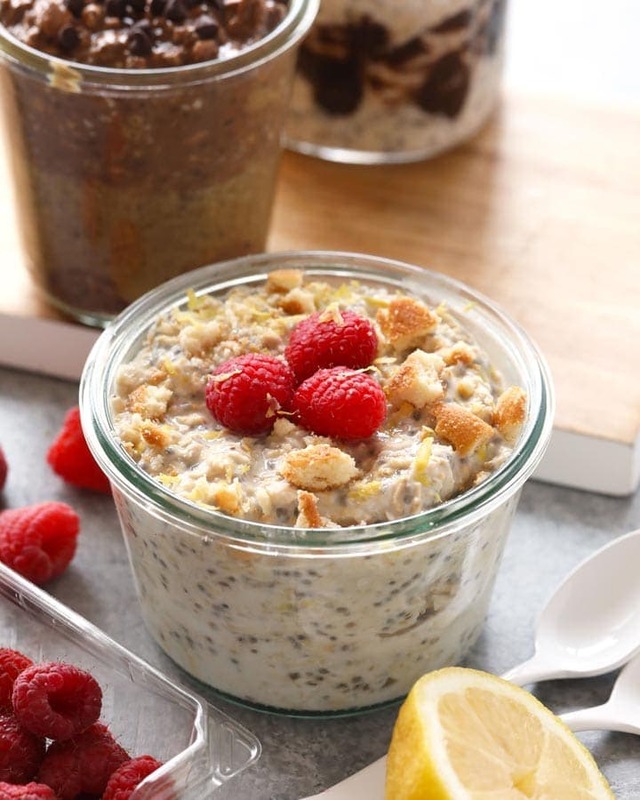 In this recipe we used rolled oats so that you can taste that delicious, chewy oat texture! baking powder: Baking powder is the way to go with pancakes! You’ll need 1 teaspoon. eggs: Eggs not only add fluffiness to this gluten free pancake recipe but protein too! 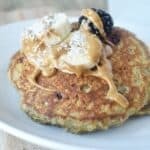 If you’re looking for a vegan option, you can try using 2 flax eggs instead! mashed banana: Since mashed banana is the only true sweetener in this recipe, the riper the better! vanilla extract: Can’t go wrong with a splash of vanilla extract. 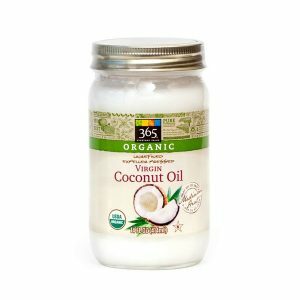 coconut oil: We nixed the butter and used coconut oil instead for a silky smooth flavor and texture! 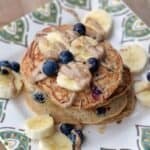 How do you make healthy banana pancakes? You only need 7 ingredients to make healthy banana pancakes. 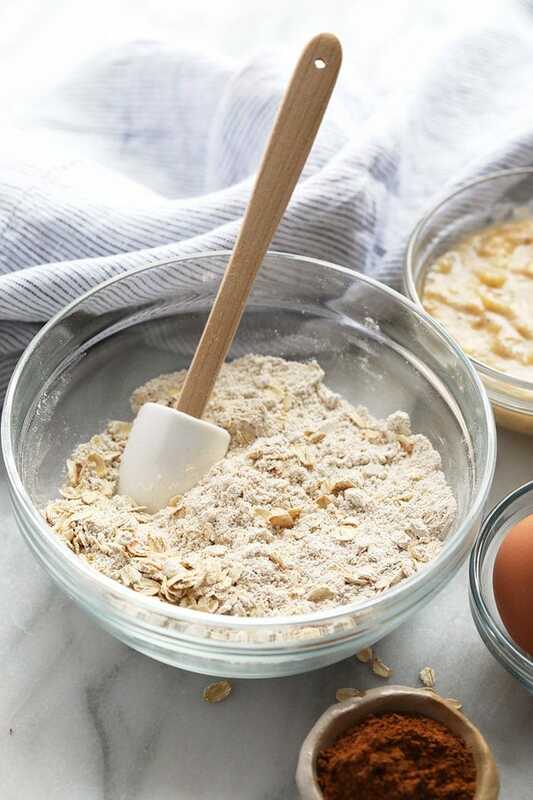 Mix together oat flour, rolled oats, baking powder, eggs, mashed banana, vanilla, and coconut oil. Then, cook over low/medium heat. 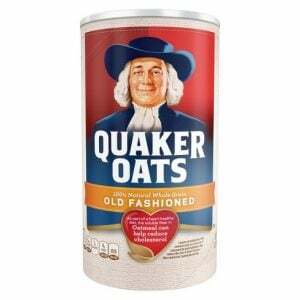 Can you make pancakes with oatmeal? 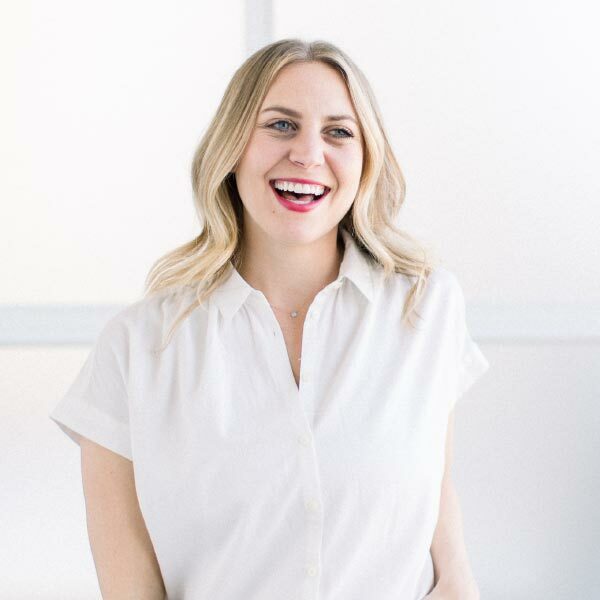 Girl, yes you can make pancakes with oatmeal! 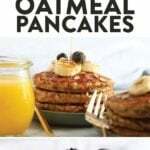 And, if oatmeal is the only grain you have in your home, no fear, because you can grind your oats into oat flour in order to make the most delicious oatmeal pancake recipe out there! 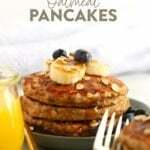 How do you make healthy banana pancakes without eggs? While we haven’t officially tested this method, feel free to substitute the eggs in these healthy oatmeal pancakes for flax eggs. In order to make a flax egg, mix together 1 tablespoon of ground flax seed meal with 3 tablespoons of water. Mix and let sit for at least 15 minutes or until it turns gummy. 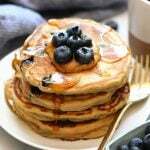 Are banana pancakes good for you? Banana pancakes are a healthy breakfast option that pack in whole grains, a serving of fruit, fiber, and protein! 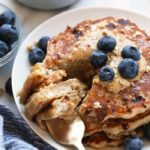 These gluten-free banana pancakes are dairy-free, gluten-free, kid-friendly, and freezer-friendly! First, let your pancakes cool completely. The reason we do this is so that the pancakes can come down to room temperature and stop producing so much moisture (steam). This will prevent freezer burn in the freezer. Then, stack 1 serving of pancakes (2 pancakes) together. Tightly wrap them in a piece of plastic wrap. Make sure to remove as much air as possible (this is also to prevent freezer burn). Place pancakes in the freezer and freeze for up to 3 months. Option 1: Thaw pancakes in the refrigerator overnight. Then, microwave for 60 seconds in the morning. Option 2: Place frozen pancakes in the toaster and toast on medium. Use our recipe index to search for your favorite healthy pancake recipes. You can also sort by dietary needs, too! Begin by placing dry ingredients into a medium bowl. Whisk until combined. Then, mash bananas in a large bowl. Add eggs and vanilla and whisk until combined. Transfer dry ingredients into wet and mix until combined. Finally, add in melted coconut oil and mix again until combined. Heat a large skillet over low/medium heat. Spray with coconut oil cooking spray. Spoon on about 1/3 cup of batter and let cook for 2-3 minutes on each side. Repeat. Option to sub any pureed fruit for the mashed banana. Suggestions include applesauce or pumpkin puree. If your batter is a little too thick (all depends on how ripe your bananas are), add a little bit of almond milk to the batter. Protein powder: if you’re looking to add protein powder to this recipe, you can sub out 1/4 of the ground oat flour for 1/4 cup of your favorite protein powder.